"Aren't all customs better than stock? Phooey!" The answer to that question is a matter of perspective. Most people think of custom bikes as good-looking. Not entirely inaccurate. But to many that's all that matters. Unfortunately I cannot be that person. Not thinking about riding a bike - and that includes customs - is like going to an unlimited buffet with your mouth sewn closed. Painful, useless and frustrating. And if I'm honest, I've seen so many customs that fail the riding test that it scares me. I remember seeing one that was so bad that even the guy who made it was afraid to ride it. He said, "Only for seeing. Kindly adjust." Which is why the Motomiu bike blew my proverbial socks off. Because it looks, clearly, like someone's customised something. But it also clearly looks like something you could ride. And when I finally got off it - something you would ride. And maybe even should ride. But let's back this overloaded truck up a bit. 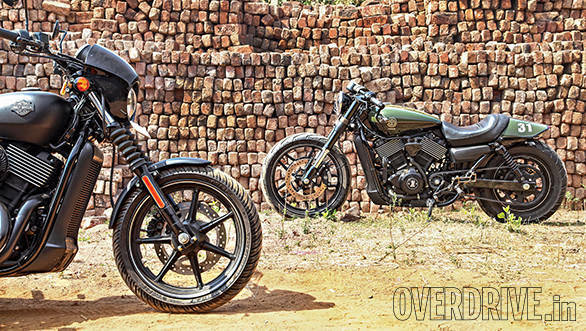 The Harley-Davidson Street 750 is a terrific motorcycle but it isn't quite finished. 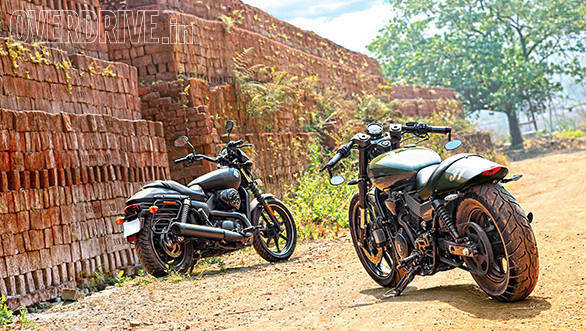 Harley might at this point bring out their P&A (Products and Accessories) catalogue but the point is that the Street has issues that Harley have to fix, not their P&A team. The Motomiu bike fixes many of these issues and opens a handful of doors that lead to rooms I'd love to play more in. The first thing you notice about the Motomiu is that there's almost nothing done to the engine. This is good. I love the torque and feel of the S750 and leaving it alone is a smart decision. As Apple gurus like to say, it isn't just what we can do, it's also what we choose not to. All Motomiu did was build a louder exhaust and wrap it in heat-tape. And mysteriously, disconnected a switch inside, that means you've to shift to neutral if you want to start the engine. On the chassis front, the mods are more complex. There's a full-on Night Rod Showa-made front-end with a bigger rim, better tyre, twin-disc brakes (plus cables and master cylinder). That is an expensive front-end but we will come to that later. The fatter - and upside down - forks are mounted in a custom triple clamp set. What this does is lower the motorcycle overall. But Motomiu allowed the taller 19-inch front tyre and the higher profile of the rear tyre to raise the bike back up so that the ground clearance is about the same but the stance is more dramatic. At the other end of the chassis, the mods are less involved. The rear tyre is a fat Shinko but the rest is stock. Above that tyre, the subframe was modified by hacking off about four inches and a bigger diameter replacement tube being added back for strength. This reduces the rear overhang and creates a crisper rear-end that handily eliminates a big Street 750 problem. 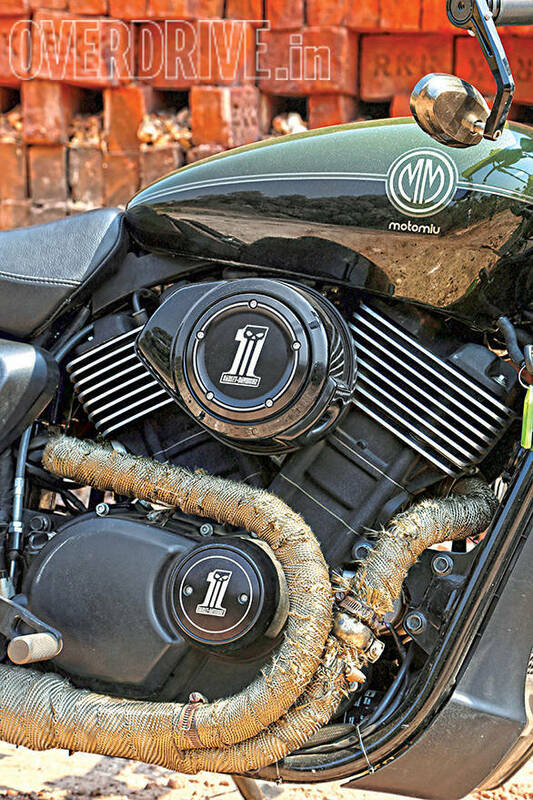 It puts the 'wow' back in the "Oh, it's a Harley-Davidson". Look closely and you will also notice the lovely machined mini-frames that Motomiu is using to relocate the footpegs to a slightly sportier position. The seat is new as well. The final piece of the ergonomics puzzle are new clip-ons. These sit on almost comedic oversize mounts. 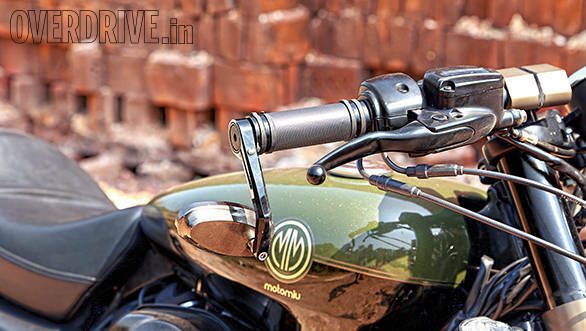 At the end of each clip-on bar is a knurled aluminium grip that ends neatly in a drop-down bar-end mirror that's a Royal Enfield Continental GT accessory anodised to match the colours of the bike. The bike comes together rather well. The wide clip-ons make the weight of the V-Rod hardware up front easy to get used to while the drop-down mirrors work well enough as well. The only change I would make is to the pegs that feel too far apart and I suspect if the bike was a little narrower between the ankles, it would feel more precise, centred and purposeful. But hang on, Motomiu says the Katanga Uno is about 20kg lighter than stock and that's not a small amount of weight. The note from the exhaust is smooth and it sounds a little less bassy than I'd like but it's a good sound overall. To be honest, I have more issues with the fraying heat tape than the audio track. The bike is lovely to ride as expected. The engine produces its effortless torque at all revs and you can have astonishing acceleration on demand. Trundling along at stupidly slow speeds in top gear is no biggie either because the 750 produces only a modest amount of power from its displacement. This means endless torque and a hugely flexible engine. The chassis surprises you. 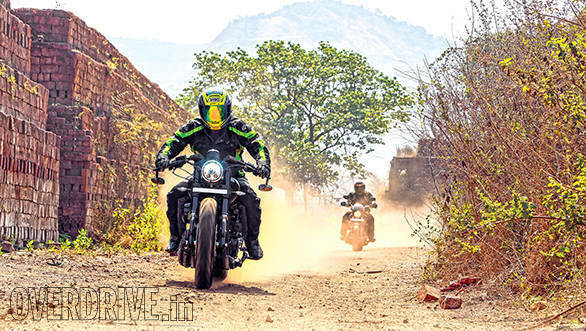 The front-end feels more connected and assured and that means you attack corners on the Motomiu, not just get through them. The stock Street 750 already had good ground and cornering clearance and the Motomiu has the same speed breaker manners. The pegs moved back and up means you can theoretically lean it more. But since I don't own the bike (and it has a Korean Shinko tyre at the back that I've history with), I'm not trying to find the new limit. Just happy at the promise of it. The V-Rod's brakes also mean that the Motomiu actually stops. There is almost too much brake force on offer up front. Harley have worked on the stock S750's braking but it remains one of the weaker attributes of the bike. The Motomiu takes a very expensive route to the fix. But it feels right to use. When I returned the Motomiu, I was very happy to have ridden it. All the changes I would suggest are basically tweaks rather than dramatic changes and I like how the motorcycle coolly straddles the great to look at and great to ride sides of the picture. Of course this comes at a cost. 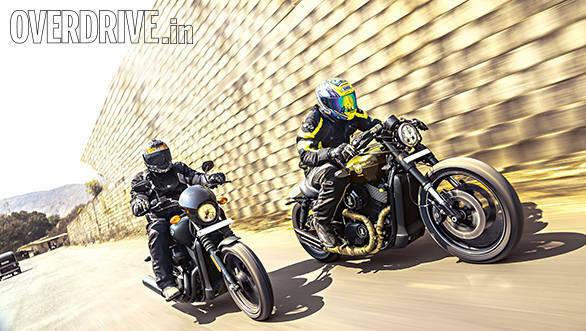 The motorcycle with the Showa front-end will cost about Rs 4.5 lakh to build - you donate your Street 750 to the project. 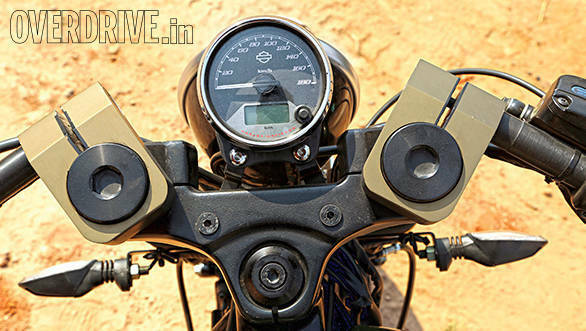 A KTM Duke front-end produces a similar look and feel, but is Rs 1.5 lakh cheaper. The other big ticket item is that LED head lamp that comes from the Harley P&A catalogue. That's Rs 50,000 roughly alone. 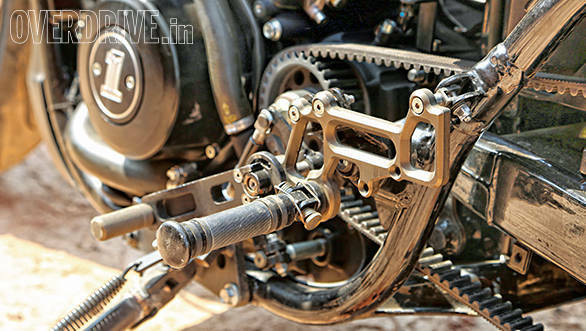 Motomiu also does a one-off T6 aluminium, machined from billet front wheel which is a rather expensive though dramatic addition that will cost another Rs 1.5 lakh on top of everything else. Yes, these aren't small numbers but the results are very impressive undoubtedly. In some ways, I almost wish that I hadn't taken the stock Street 750 along for the pictures because the Motomiu serves to pointedly highlight many of the niggles that I suspect the next model update will fix. On the other hand, I've always believed that the Street 750 was a dramatically good project bike. I've thought of owning one but where my to-be-garaged bike plans usually involve minimal mods, the Street 750 beckoned me down a different street. There was a list of things I'd throw away and another list of things I'd change. And then it would be perfect. And that's what the Motomiu proves. For a long time, we've had either terrific stock bikes - why would you mod them - or terrible stock bikes - no point modding them. The Street 750 is delicious from this perspective. It's quite good as stock but has enough niggles that you don't want to leave it stock. And when someone with capable hands comes along - to wit, the chaps at Motomiu - the results can be stunning. Aren't all customs better than stock? Doesn't matter. I think this one is.